Dual, orthogonal switching of the "schizophrenic" self-assembly of diblock copolymers. A pair of \"schizophrenic\" micellar systems is compared that combines a zwitterionic polysulfobetaine block with a non-ionic and block of either PNIPAM or PNIPMAM. Both block copolymers are twofold thermoresponsive and exhibit LCST as well as UCST behavior in aqueous solution. The zwitterionic block is designed such that its phase transition temperature in pure water is significantly higher than the ones of PNIPAM or PNIPMAM. By temperature dependent turbidimetry, 1H NMR and SANS, we study the overall phase behavior, the structure and the interaction between the micelles. 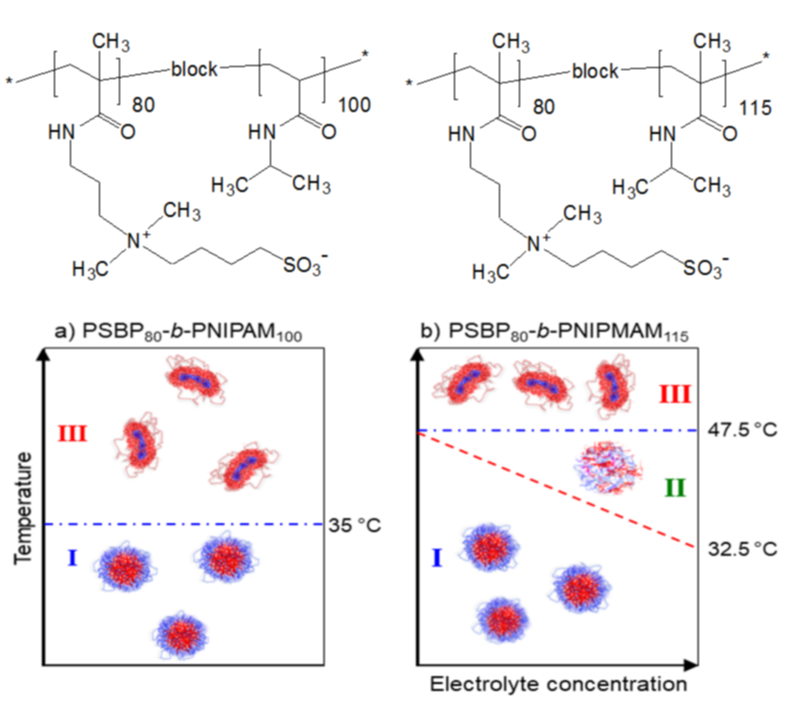 We demonstrate dual thermosensitive and salt-sensitive behavior with \"schizophrenic\" micelle formation, whereby the width of the intermediate regime when both blocks are hydrophilic, can be tuned by the addition of electrolyte.